He’s been called ”a Danish research superstar” and builds his groundbreaking research upon the humble ideology “my idea is your idea”. This week, his extraordinary research and impressive career is acknowledged by his receival of the Ib Henriksen research award. 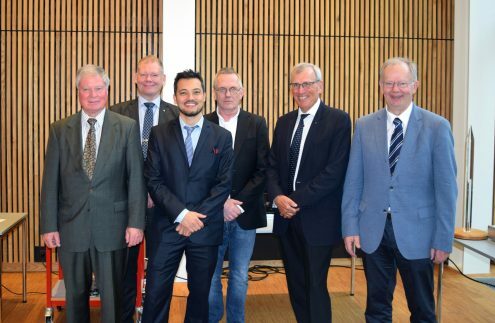 There’s been reason for more than the usual amount of cheering at the Institute for Photonics at the Danish Technological University (DTU), because at a reception on Wednesday November 8th, Professor and head of center, Leif Katsuo Oxenløwe and his extraordinary research contributions were honored. The award is given to Leif Oxenløwe based on his seminal research in optic communication technologies and high-speed internet. Oxenløwe’s aspiring career began in ’02 where he finished his Ph.D. in Optic Communication at DTU and stepped into the role as postdoc and assistant professor at the Institute for Photonics. In ’09, Oxenløwe’s career took a leap forward as he was given the European Reserach Council’s (ERC) Starter Grant. Oxenløwe is internationally recognized for creating remarkable results in his field of research, and he has beat up to several world records in optical data transmission, which the DNRF has previously written a short news article about. In ’14 the DNRF funded Oxenløwe 59 mill. DKK for him to create his center, Silicon Photonics for Optical Communications (SPOC). Among other aspects, the center researches in creating a more energy-efficient communication infrastructure based on optical communication, and the purpose is to find solutions for the main challenges in communication systems: The energy use and the possible data capacity. The team has recently developed an optical chip that can process enormous amounts of data in an ultra-high speed. In the laboratory at DTU the chip has processed a data signal on 1,28 terabytes per second. “Our new chip actually has the powers to process most of the data signals that are on the internet today. Due to its band broadness on a few hundred nano meters and enormous speed it has got the potential to be used instead of a lot of the smaller, energy-inefficient components,” says Leif Katsuo Oxenløwe to Videnskab.dk. He predicts that the technology will be able to reduce the energy consumption with a factor up to 100 or maybe 1000 in some places of the global network. Read more about the SPOC-center’s research on the DTU webpage. 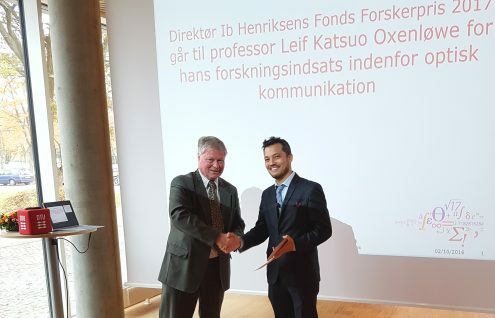 In other words, Leif Oxenløwe and his Center of Excellence seeks to optimize what we all surround ourselves with on a daily basis: Technologies for communication like broadband, data transmission and safety. The research is therefore beneficial for the general, technology using Dane – and for the entire Danish community. Especially this is one of the reasons that Oxenløwe is given the prestigious award, the Ib Henriksen research award. The award is given to people that have executed research or science beneficial for Denmark. The award prize is 250.000 DKK.